don’t you think he or she should choose the color portions wisely? Alas, this is never the case. 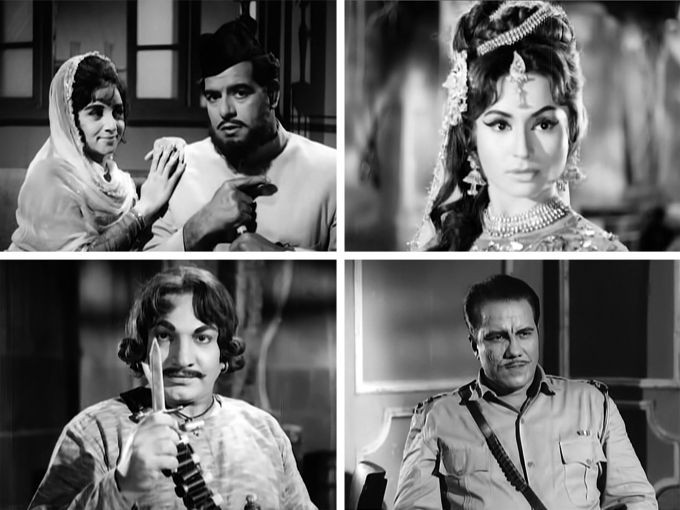 In Faulad for example, most of the action takes place in fabulously ornate palaces and havelis and on a pirate ship, and it’s all black and white. At the end, when all the action is taking place in a boring, dingy dungeon—it’s in color! I don’t need to see a gray stone dungeon in color! Nevertheless, Faulad is a lot of fun. 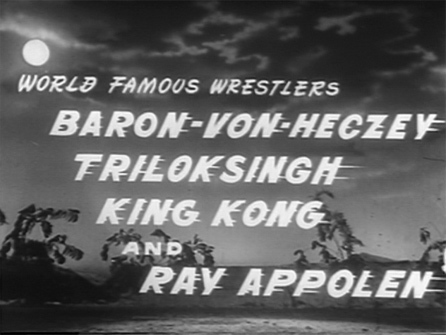 It’s hard to go wrong when Mohammed Hussain is directing (and Dara Singh, Mumtaz and Minoo Mumtaz are starring in) a film with swashbuckling Arabian Nights championship wrestling action and gorgeous songs (by the criminally ignored GS Kohli)! 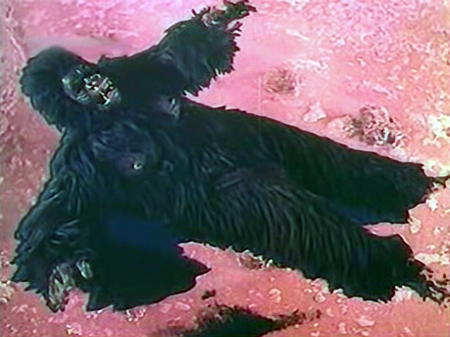 We left our heroine Rita dangling over sudsy hot pink lava as a giant ape menaced the rest of her traveling companions. Blinding Eastman Color! 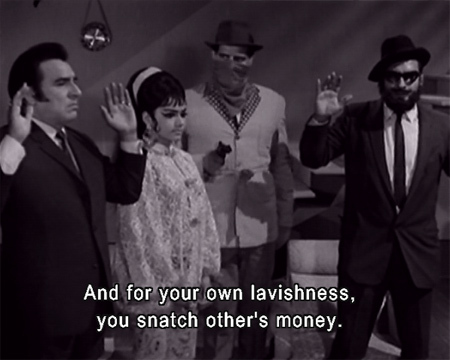 To my everlasting regret, this film has not made it to DVD with subtitles yet (*now it has!*). 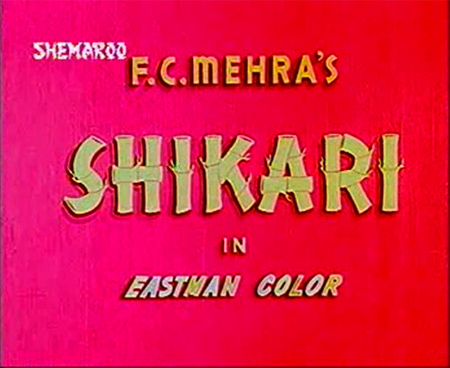 But my friend Suhan found it on VCD with no subs and sent it to me; having seen it, I now believe that subtitles are unnecessary, although I would still like to see it nicely digitized and put on DVD (but not by Shemaroo, please). I saw (and understood) enough to tell you that it was cracktastic! And also, chock-full of plot holes and abandoned plot threads, which didn’t matter one bit. Mostly, the visuals were so entertaining (despite the poor video quality) that I thought I’d put together another comic strip synopsis. The completely loony amalgamation of cultural references more than makes up for any lack of narrative. Plus, the songs by GS Kohli are lovely and include two dances for Helen! 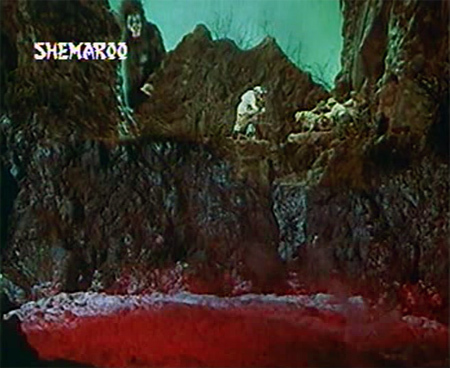 All you really need to know is this: there’s an ice-skating chimp, two crazy scientists, exotic tropical jungles, spear-throwing natives, a volcano, Godzilla, King Kong, a snake pit and more; and a cast which includes Helen, Madan Puri, KN Singh, Tun Tun, Ajit and Ragini. Although this movie was made in 1964, it very well could have been made in 1954 or even 1944 given the quality of its special effects. They are so very special! 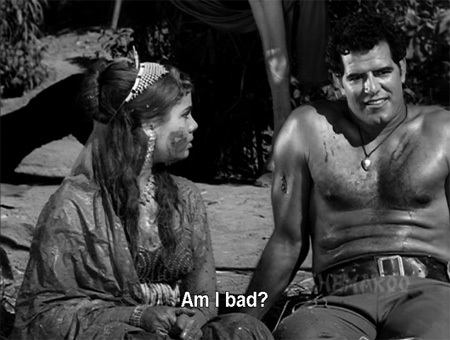 In addition, the heroine of the film is none other than the ever-fabulous Helen, opposite wrestler Dara Singh. Aaya Toofan was the source for this trivia post, and for my avatar as well. This is not to say that it’s a good film; it most emphatically is not. It’s really bad. Silly story, bad acting, the whole nine yards. But it’s B-movie fun for those who enjoy such things (I do! I do! ), and of course there is Helen. And wrestlers. Lots and lots of wrestlers.